The Church of St John the Evangelist was the parish church of Carlton-in-Lindrick, and is a unique and architecturally important late-Saxon and early-Norman church. The west tower dates from the 11th century, although the buttresses, belfry, battlements and pinnacles were added later. 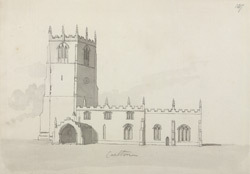 The church underwent considerable repairs in 1831.